Give Your Car an Extra Boost of Speed! 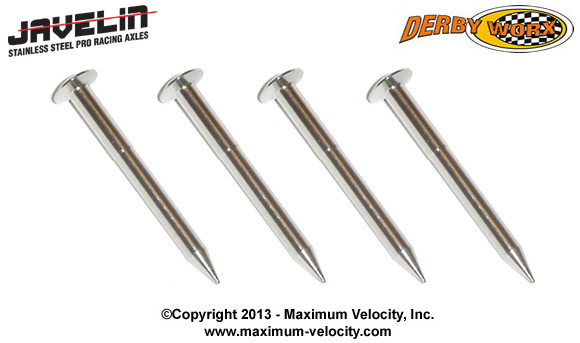 Maximum Velocity is now offering Pro Stainless Steel Axles, which are CNC machined axles formed to resemble Cub Scout axles, but with a two-step shaft for a good fit with axle slots or holes (.088), and an excellent fit with the wheel (.093). 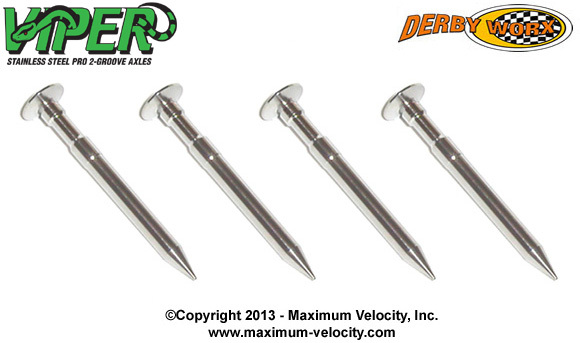 The axles have a tapered head, no burrs and crimps marks, and are made from a high quality stainless steel for increased strength, and reduced friction. Both grooved and non-grooved versions are available. These axles are ready to enhance performance when used with Cub Scout/BSA, PineCar, Awana, MV, and other wheels. I saw these last night after I got the latest newsletter, and they look great. I'm excited to get my hand on a set of each, though I won't be using them in racing in our Pack because my rules don't allow for it. One thing I did notice is that the 10% off code for each axle sets in the newsletter will only allow you to apply one coupon, so you can only get the discount on one of the sets of axles, not both, and I wanted to pick up a set of each for testing. Is that a bug or intentional? I'm an inspector. Does a magnet stick to these axles? Does the round point match the round point on some Chinese made axles? One District I will be inspecting does not require slots and axles be visible. How am I going to catch a cheater? Speedster - You can use one coupon per order, so yes, you can get a discount on only one set at a time. TXDerbyDad - The axles are attracted to a magnet. The points are round, not chisel points like the official nail. So if your rules only allow BSA nails, you can tell the difference by the point. Also, the color is slightly different than the zinc coating of a BSA nail.